The Coop calls itself a playspace, but that’s underselling it: It’s more like a carnival-meets-playground-meets-toy store—but way less anxiety inducing. 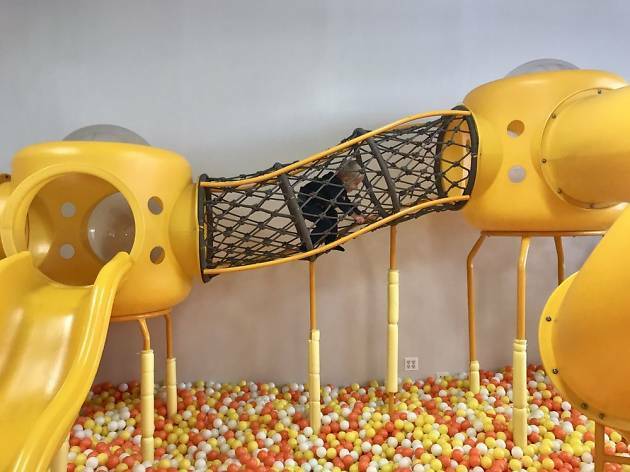 The 3,000-square-foot space includes a huge ball pit for wriggling around, an electronic dance floor, a bouncy house, a rope-climbing tube, a twisty slide, and a slew of dress-up garb, books, and toys. It’s a popular spot for open play, as well as kid birthday parties, in which parents can choose from dozens of themes. The best part, though, is the welcome amenities for grown-ups. While your kiddos bounce, climb, and dance their hearts out, parents can kick back with an impressive magazine selection, a full cappuccino bar, and free wifi.